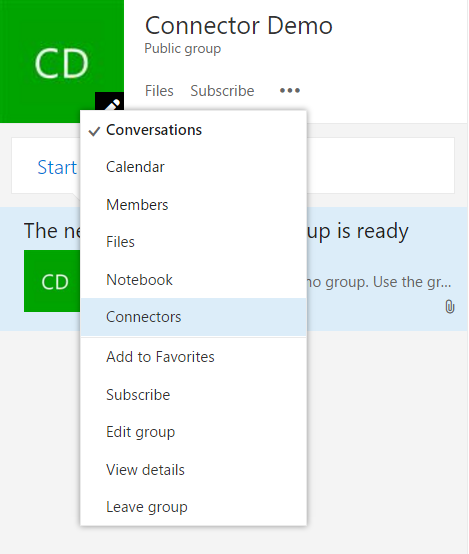 After refreshing the page with that parameter added, you will notice there’s a new Connectors option in the context menu of that particular Group. Click the three dots … and you’ll see the Connectors option. 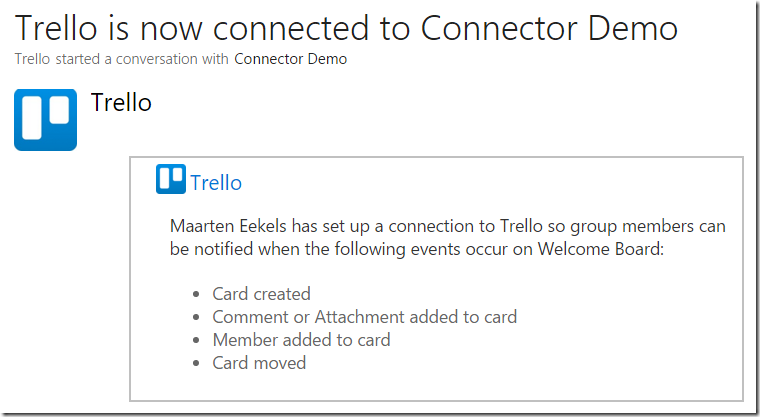 Now when you click Connectors, a new window will appear with already quite some services that you can connect. You will see that over a period of time, the number of services available will increase. For our demo, we will use Trello. 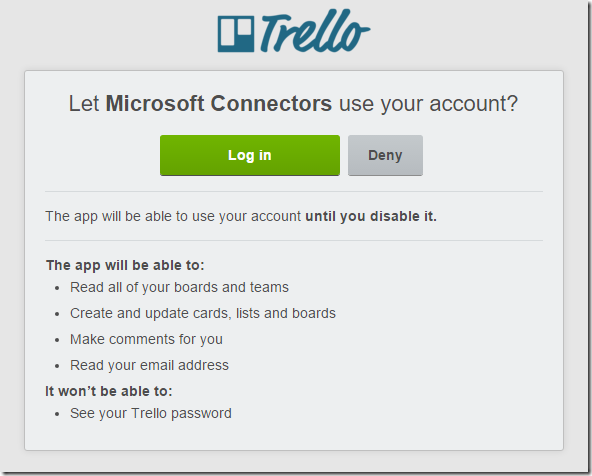 The Trello connector notifies your Office 365 Group when activity occurs on Trello cards, lists, and boards. Click the Add button behind Trello. 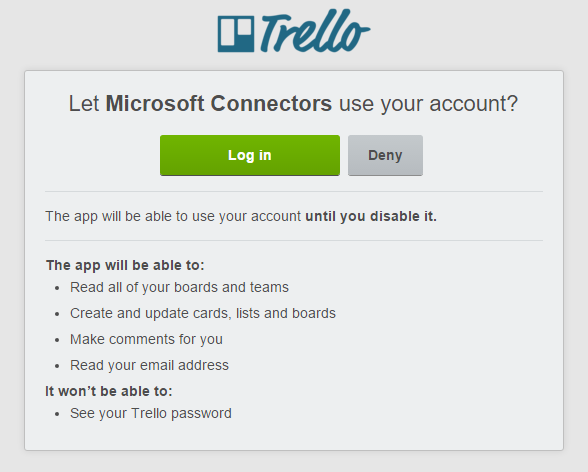 An OAuth connection window will pop up to authorise Office 365 Connector to use Trello on your behalf. You can then choose the Board you’d like to receive notifications for, and you can select which kind of notifications you’d like to receive. Note, that if you click Show more notification options, there are many, many more notifications you can subscribe to. 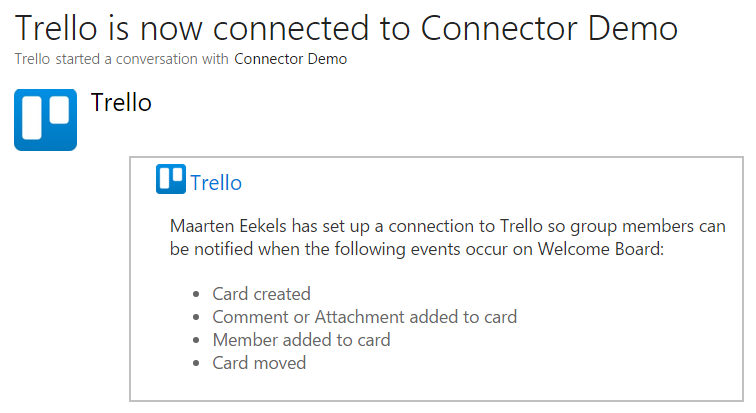 Click Save, and you’ll return to the Connections overview window where you can see that your Trello Connection has been configured. If you want you can add more Connections to this Office 365 Group. Click the Cancel button on the left top side of the window, and you’ll return to your Group homepage, where you will have received a message that Trello is now connected to your Group. Now when you create a new Card in Trello, you will receive a notification in your Office 365 Group. 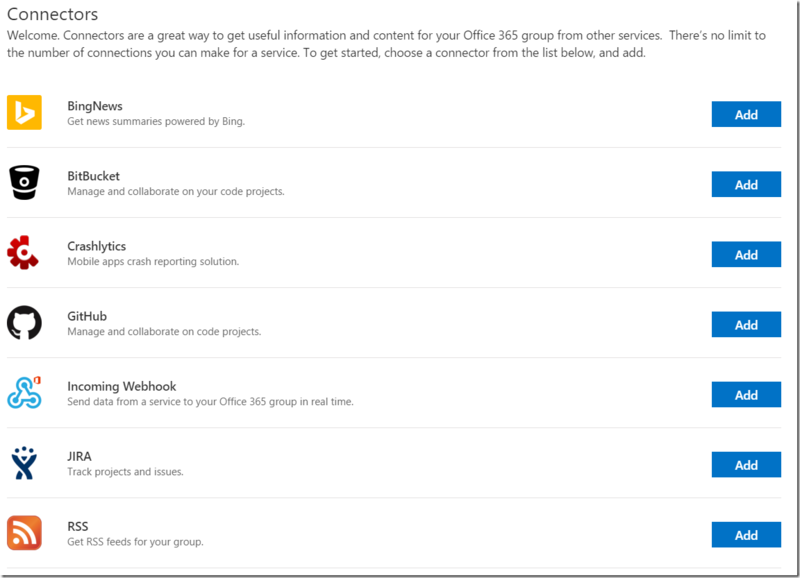 – In the Preview phase of Office 365 Connectors, only View actions are available on notifications. Later on, also other actions will become available. – Although all members of a Group can see which Connectors have been configured for a Group, only the person who created the Connector can remove that Connector. I can imagine this will change in the future, but for now this is how it works. 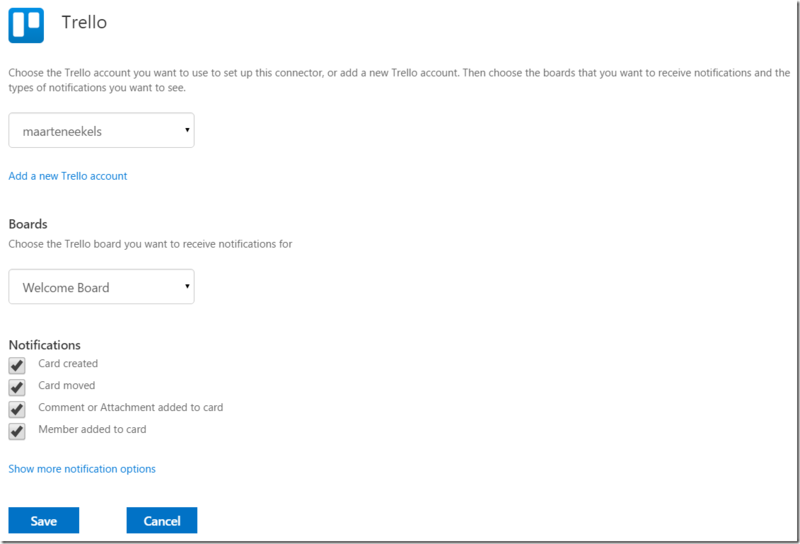 – You don’t need to be admin to create Connectors. Even members of Groups are allowed to create Connectors. Like I said, I love this feature! And I can see a lot of potential for this. Way to go Microsoft! 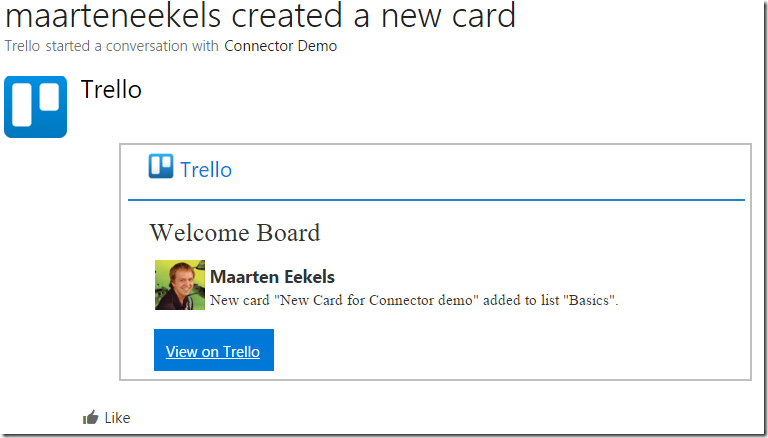 This entry was posted in Groups, Office 365 on November 19, 2015 by Maarten Eekels.